Make Music. Have Fun. Learn guitar the SIMPLE way with the National Guitar Academy. The Learn Guitar podcast from the National Guitar Academy will make you a better guitarist by teaching you our best guitar tips and secrets for rapid progress. We SIMPLIFY the guitar world so you can make music and have fun as quickly as possible. We discuss chords and chord technique, we share lead guitar secrets, we tell you how to sound more rhythmic and musical and we also teach you music theory. ‘Lead Lines’ is the part of the show when we discuss lead guitar techniques, scales, riffs, solos and secondary guitar techniques. ‘Quick Chords’ is the part of the show when we discuss chords & chord technique. ‘Tips & Advice’ is the part of the show when we answer your questions about guitar & music culture. If you’ve got a question for us please email us at “podcast@nationalguitaracedemy.com” and we’ll try our best to help you out. ‘Rhythm Section’ is the part of the show when we discuss how to boost your rhythmic ability to make your guitar playing sound more musical. ‘Theory Tips’ is the part of the show when we share some bite-sized music theory tips. ‘One Last Thing’ is the part of the show when we leave you with a parting gift; something randomly cool or interesting about music or guitar culture. For each podcast we create a ‘bonus pack’ that expands on what we’ve discussed in the episode. Each bonus pack includes video lessons, diagrams, chordboxes and practice materials, that build on the things we’ve discussed in the podcast. Episode 4: Strumming Tips, Arpeggios, Guitar Effects & Capo Secrets. 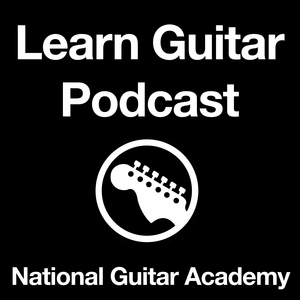 Welcome to the Learn Guitar podcast from the National Guitar Academy. We simplify the guitar world so you can MAKE MUSIC and HAVE FUN as quickly as possible. Podcast 1: We Have Lift Off!